RIP Sir Tom one of footballs legends and one of Preston's greatest men, sadly missed but never forgotten. RIP Sir Tom. A truly great man and a true gentleman on and off the football pitch. You will be sorely missed by all those who knew you. 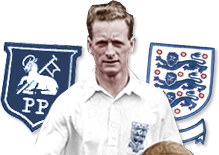 Met sir Tom Finney and his lovely wife a few times over the years, he was a true gentleman. Will be sadly missed. RIP Sir Tom. Gone but not forgotten. I thank my late father immensely for taking me to Deepdale as a young boy on alternative Saturday afternoons; to see who dad described as "The greatest footballer ever." I echo those sentiments too. Sir Tom belonged to Preston and proud Prestonians ,Preston belonged to him. Let's not forget though that he is a much loved father and grandfather, our loss is great but his family's is greater. Gone but never forgotten. RIP Sir Tom, a man few of us met but all felt that we knew. Sir Tommy.Prestons son.You will never walk alone.God bless you and RIP .From my old Dad Mr Ken Perks. Although I never actually met you, I feel as though I knew you. I am sure most Prestonians feel the same. I grew up knowing of your skill as a player, and the fact that you were a true gentleman. Rest in Peace Sir Tom. You will be sorely missed.